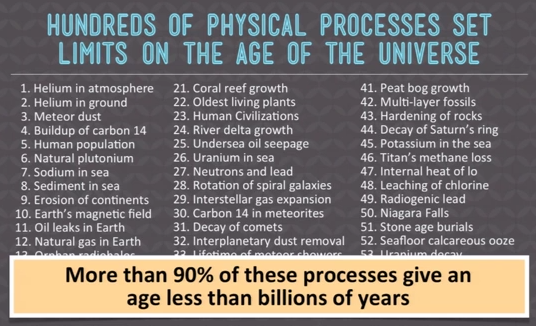 That's a Fact - Our Young Universe from Institute for Creation Research on Vimeo. That's a Fact - Seven-day Week from Institute for Creation Research on Vimeo. The work week right between the 10 Commandments written by God. 8 l“Remember the Sabbath day, to keep it holy. 9 Six days you shall labor and do all your work, 10 but the nseventh day is the Sabbath of the Lord your God. In it you shall do no work: you, nor your son, nor your daughter, nor your male servant, nor your female servant, nor your cattle, nor your stranger who is within your gates. 21 For since by man came death, by Man also came the resurrection of the dead. 22 For as in Adam all die, even so in Christ all shall be made alive. How can Pain, Death, Killing, Disease, Struggle, Suffering, Extinction be Good? Problems for the old earth theory. 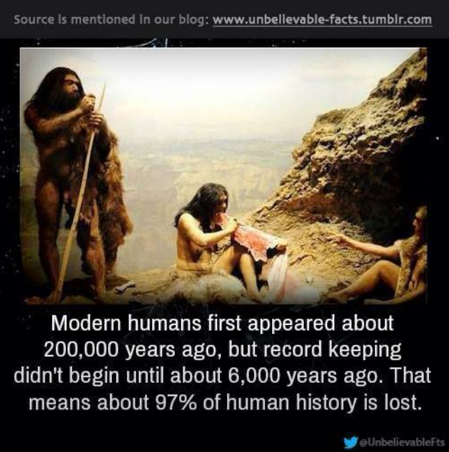 I do find it puzzling that recorded human history started around 6000 years ago. There were no civilizations from 200,000 years ago. No empires, no writing, no architecture, no recorded history......NOTHING. Civilizations started appearing around 6,000 years ago. My question is why didn't mankind do anything 7,000 years ago or 200,000 years ago with early "modern humans?" People are drawn to each other and want to create societies. Why didn't they? Evidence for a Young Earth: Click here to read more.